[quote]I have had five different trainers since getting into weights and all around workouts. Tammy is so far superior to all of them….she is so knowledgeable about the body and the importance of stretching combined with changing your workouts constantly to insure all muscle groups are being addressed…she is the best! [/quote][hr] [quote]Regular exercise has been part of my normal routine for almost seven years. Over that period of time I had the pleasure of working with several personal trainers. The best experience, both with results and fun, has been with Tammy Eaton. I am part of the over 50 baby boomers. I worry about getting older and I have my share of aches and pains. Tammy listens! She tailors my workout to meet my individual needs. Before I became Tammy’s client, I tried working out on my own and injured my shoulder during a weight lifting session. Tammy showed me specific exercises to target the problem and now my shoulder is pain free. Thanks Tammy!!! [/quote][hr] [quote]I have been exercising all my life, in sports and in general, and in the last 22-23 years with a personal trainer. In the room where I use the treadmill I was able to see others exercising. I noticed Tammy Eaton working with her clients and saw how closely she worked with them and how much time and effort she spent with them. She had a pleasing personality and I liked her laugh and her attitude towards her clients. She is my trainer now and I notice a difference in the way I feel and look. I look forward to our three sessions a week and try very hard not to miss. [/quote][hr] [quote]I asked myself daily, where do I want to be in five years? [/quote][hr] [quote]Tammy has come to my house for six weeks and I’m already getting up from my chair MUCH easier and can move my shoulders much better as well. She even rubs my feet to improve my balance and circulation! I’d highly recommend her! 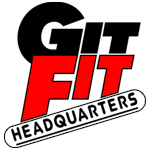 [/quote][hr] [quote]Finding GIT FIT Headquarters has been God sent… really! I won’t bore you with the trail of events that led me to my personal trainer, Tammy, but I am blessed that I am now active at GIT FIT. After six months, I’m not only looking better, I’m feeling better. Even my doctor said so after my recent complete physical. His words, not mine, “Stephen, this physical looks great… near perfect numbers!” I have no doubt that these results have been, in part, as a direct result of my training sessions with Tammy at GIT Fit Headquarters. – Stephen Kleinsmith (diagnosed with Parkinson’s in 2006). exercise although living a busy lifestyle. Taking the time and making the commitment to my body and my future has had its rewards. Combining exercise with Isagenix support, has helped with weight control and the actual shape of my body, and at 57 I can use all the help I can get! she makes exercise fun. Get moving at Git Fit Headquarters with Tammy, you will be feel much younger!